The relatively cool, dry climate of the Pliocene, inherited from late Miocene times, created conditions under which the types of vegetation with which we are now familiar began to appear. 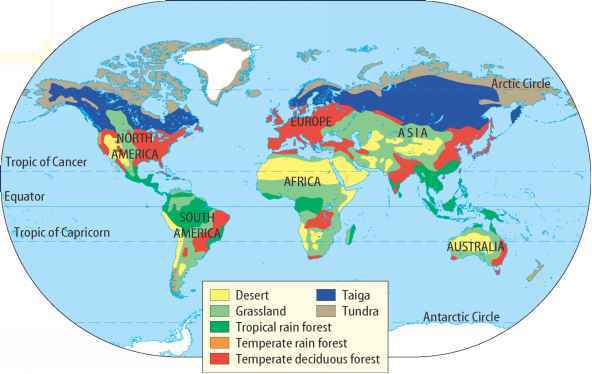 Tundra vegetation appeared over permafrost inside the Arctic Circle, followed by a belt of coniferous evergreen forest ("taiga"). Deserts, practically unknown earlier, appeared at lower latitudes. The grasslands that now spread over large continental areas were more arid and treeless compared to the earlier wooded savannas. Tropical forests were squeezed into smaller areas around the equator. Such conditions were not conducive to maintaining a diversity of either plants or animals. Mammalian herbivores had to cope with new challenges in dealing with poorer quality forage. A number of those that could not adapt to a changed world became extinct, especially in North America, which was not connected as yet to an equatorial rain forest zone. Those that did adapt further increased in body size, a trait that equipped them better to deal with unfavorable seasons and to subsist on a diet of coarse plants. The "third radiation" of the proboscideans, that of the true elephants, now proceeded in earnest. The evolution of the elephantids during the Plio-Pleisto-cene was correlated with fairly rapid changes in skull architecture and mastication apparatus (fig. 1.5), apparently to deal with the changing vegetation conditions. This involved a transition from the combined grinding and shearing teeth function, characteristic of gomphotheres, to a mostly shearing function, as in the elephantids. Concurrently, there was an increase in the number of plates (lamellae) with U-shaped valleys in between. Horizontal replacement of the molars was well developed. The most striking feature of dental evolution was the rapid increase in crown height (hypsodonty) with thinning of the enamel. Clearly, these changes enabled the elephantids to chew coarse vegetation, including abrasive grasses, fibrous bark, and other plants likely to wear down the molars quickly over a longer life span. Primelephas gomphotheroides, or a very closely related form, gave rise to three lineages in sub-Saharan Africa. The evidence of the fossil record suggests that Loxodonta was the first to differentiate, close to the Miocene-Pliocene boundary, followed by Mammuthus (mammoth) and Elephas during the early Pliocene. The molecular and morphological data, however, are equivocal on this point. cies, Mammuthus africanavus, occurred in late Pliocene times in the Chad basin and other northern African sites. These African mammoths clearly lived in a tropical environment, a far cry from the icy wastes of the tundra their descendants finally occupied. South of the Sahara, there is no evidence for mammoths after the late Pliocene. In the meantime, an early mammoth form had migrated into Europe, where Mammuthus meridionalis is well known at a number of sites, from England and France to Italy and Russia. Vincent Maglio believed that M. meridionalis derived from M. africanavus, which migrated across the Gibraltar in western Europe. Mammoth specialist Adrian Lister, however, thinks it more plausible that there was a migration of descendants of M. subplanifrons through the eastern land bridge (Middle East to Turkey) into Europe. Standing 4 m in height, M. meridionalis would have towered over the modern elephants. The creature inhabited mixed deciduous woodland with browse-trees such as oak, ash, beech, hemlock, wing nut, and hickory. This forest-dwelling mammoth still had low-crowned teeth (for an elephant) with 12-14 thick-enameled lamellae on the last molar. At this time during the late Pliocene, Europe seems to have enjoyed a relatively warm, mild climate. Meanwhile, Loxodonta was well differentiated in Africa. The earliest recognizable species, found in Kenya in deposits 4 My old, is Loxodonta adaurora, which lived through most of the Pliocene. Its dental advancement over Primele-phas was comparable to that seen in the earliest mammoths. Over its evolutionary age of about 2 My, however, it seems to have changed little in its dental characters. By the late Pliocene, Loxodonta adaurora was becoming scarce in areas of former abundance in East Africa, even though the local ecology had not changed much. Most likely, this was due to its displacement by a member of the third lineage of elephants, the genus Elephas. Elephas ekorensis, the first recognizable species of this genus, appears along with the earliest mammoth remains in East African deposits. With narrower plates and thinner enamel, it had slightly more progressive dental characters than the earliest loxodonts. During the Pliocene itself, E. ekorensis gave rise to two lineages, an Afro-Eurasian lineage that eventually reached a dead end and an Asian lineage that gave rise to the modern Asian elephant. There is little doubt that E. recki, the dominant Elephas fossil in East Africa at that time, was a descendant of E. ekorensis. The Asian derivative of E. ekorensis was E. plani-frons, found in late Pliocene and Pleistocene deposits of the Middle East, Indian subcontinent, and northern China. This species, or another that closely resembled it, may even have reached Java, where it further evolved into distinctive forms. The earliest, or one of the most important, major cooling event in the Northern Hemisphere actually occurred about 2.5 My ago. Evidence for this event comes from sites around the globe. Loess deposition began in Central China, temperatures dropped in the Andes and the Netherlands, and seasonal climate was established in the Mediterranean. This was the period when the Sahara became a permanent desert, the forests became savannas in eastern Africa, and even western Africa turned somewhat arid. Alan Turner examined mammalian faunas in Africa and Europe and found this climatic phenomenon reflected in distinct evolutionary changes. Elephas recki progressed over time through five recognizable evolutionary stages toward higher tooth crowns, more plates, and thinner and more folded enamel. The major shift in hypso-donty occurred between 2.3 and 2.0 My ago. At the same time, the genus Loxodonta disappeared locally in the East African fossil record. It is possible that Loxodonta, predominantly a browser, was affected to a greater degree by the loss of moist woodlands. Mammuthus also made its first appearance in Europe around this climatic event 2.5 My ago. The radiation of the elephantids was yet to reach its peak diversity; this was retained for the momentous Pleistocene. Apart from witnessing the rise of the three major elephantid lineages, the Pliocene was also the stage for other interesting proboscidean events. The amazing Deinotherium survived through the Pliocene. The stegodons continued to push into the corners of Asia, differentiating into newer species in the Indian subcontinent, China, Japan, Indochina, and Southeast Asia. At least three species (Stegodon bombifrons, S. ganesa, and S. insignis) are recognized from the Indian subcontinent, with the last probably endemic. The S. ganesa here was most likely an invader from Southeast Asia. The distribution of S. zdanskyi in both northern China and Japan suggests that a land connection existed between the Japanese islands and mainland Asia during the Pliocene. Several stegodon species are known from the East Asian region. Stegodon elephantoides from Myanmar (Burma) is considered a classic stegodon, but has been poorly studied. It is safe to assume that, prior to the arrival of Elephas, a vast territory from South Asia into Southeast and East Asia was a stegodon kingdom. Interestingly, among the stegodons, there is probably the only instance of a proboscidean migration into Africa. Stegodon kaisensis is derived from one of the early Asian stegodonts that migrated back during the Pliocene to the cradle continent of the proboscideans. 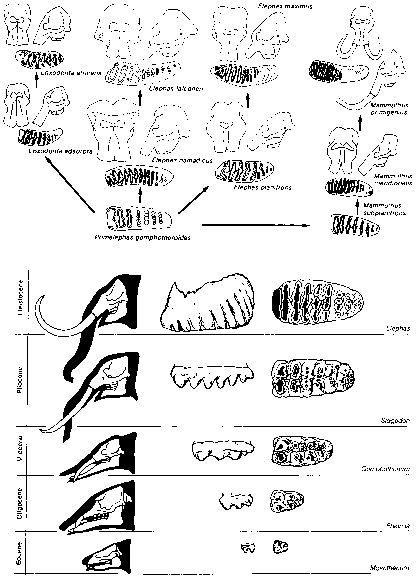 The very early Pliocene, about 4.5 My ago (the late Hemphillian in North American stratigraphy), was a period of the highest mammalian extinctions in North America in the preceding 10 My. These were associated with a trend toward a cooler, drier climate in the continent's temperate belt. A mammutid (Pliomastodon), a gomphothere (Gomphotherium), and an amebelodontid (Amebelo-don) did not survive this episode. The mammutids and the gomphotheres, however, left behind successors. Autochthonous speciation in the continent ensured that one mammutid and at least three gomphothere genera continued to reign the Pliocene New World. The American mastodon (Mammut americanum) first appeared about 4 My ago in the region of the present Washington State. Its eventual distribution over North America encompassed a large tract up to the East Coast, although a considerable degree of ecological separation from the mammoth is evident from their fossil distributions during Pleistocene times. The mastodon continued to be predominantly a browser in woodland habitat. About 3 My ago, the establishment of the Panamanian land bridge triggered the great American interchange of plants and animals across the northern and southern continents. This passage, however, was a "filter barrier," regulating the exchange through its varying ecological conditions. Strangely, Mammut americanum did not migrate into South America and neither did the gomphothere Rhynchotherium, which evolved autochthonously from gomphothere stock during late Miocene times. Other North American gomphotheres, however, took advantage of this passage to move into the southern continent for the first time in proboscidean history. Cuvieronius, a gomphothere that may have evolved from Rhynchotherium in southern North America, may have been one of the first to reach South America. This creature favored mesic coastal savanna and scrub habitats; it may have thus used the warm dry periods when tropical scrub covered the Panamanian corridor to disperse into South America. Three other gomphotheres (Stegomastodon, Haplomastodon, and Notiomas-todon) are also known from South America. Some of these gomphotheres may have been products of Pleistocene evolution after isolation on this southern continent (a recent discovery of an unidentified "gomphothere" from upper Miocene strata of Amazonian Peru raises other intriguing possibilities, including migrations from South to North America). By the late Pliocene, the mastodonts, now flourishing in North America, had died out in Europe and Asia.